Lao PDR is currently listed as a Least Developed Country (LDC). 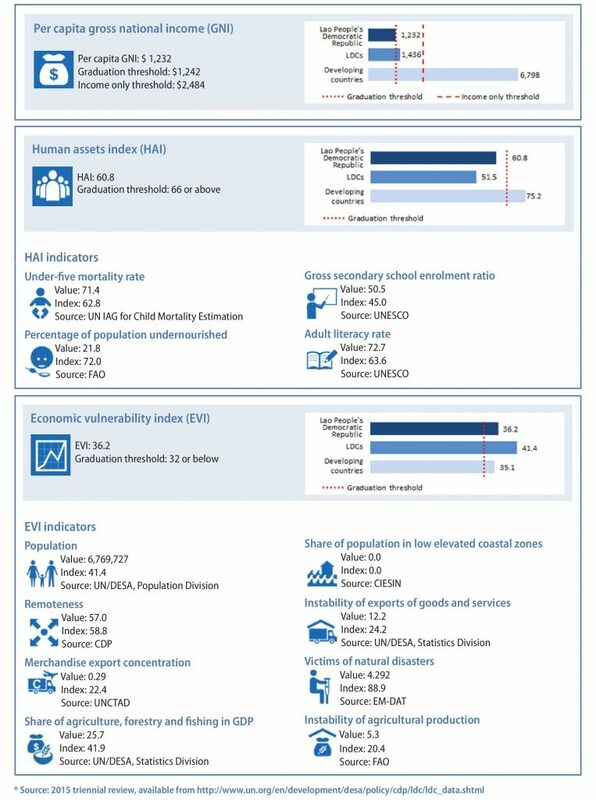 Countries recorded in the LDC category are defined as low-income countries that are facing severe structural impediments to sustainable development. Due to their status, these countries are granted exclusive access to specific international support in the areas of trade, development assistance, and general support. The list is reviewed by the Committee for Development Policy (CDP) every three years. Lao PDR’s aim is to graduate from LDC status by 2025. 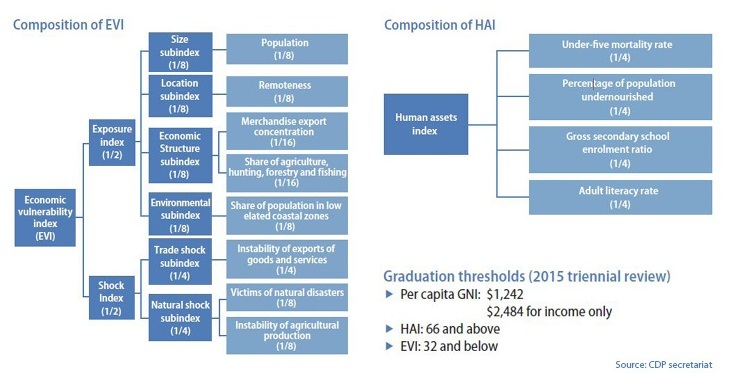 For a country to be eligible for graduation, the graduation threshold must be met for two of the three LDC identification criteria, which include per capita gross national income (GNI), the human assets index (HAI), and the economic vulnerability index (EVI). Alternatively, eligibility is given if the per capita GNI is at least twice the amount of what the graduation threshold demands. The graduation procedure is long-term, since the graduating country must meet eligibility criteria at two consecutive triennial reviews. After the country has been found eligible for graduation for the first time, the UN Department of Economic and Social Affairs (DESA) prepares an ex ante impact assessment, and the UN Conference on Trade and Development (UNCTAD) prepares a vulnerability profile of that country, which serve as inputs to the decision-making process of the CDP. Before the next triennial review, the country is then invited to present its views on the possibility of graduation at the CDP expert group meeting. As a next step, CDP recommends the country for graduation on the basis of the LDC criteria and the information provided by the country itself, UN/DESA and UNCTAD. The recommendation is endorsed by the Economic and Social Council (ECOSOC) and finally acknowledged by the General Assembly. The graduation takes effect three years after the decision by the General Assembly.